Channeling ethereal grace but designed for modern romance, our dresses are inspired by today’s classic bride. Wedding gowns with some of our styles are each hand-crafted, with hand-sewn beads, luxurious fabrics and inspired designs to suit brides of all sensibilities and sizes. We believe brides should feel nothing less than gorgeous on their wedding day. Every gown features details to set it apart and make the bride shine. We’ve created a vast array of styles, gathered into wonderfully diverse collections, each collection distinct from the others, so that the Bride may choose a gown which expresses her own individual beauty and unique personal charm, her “dream dress”! 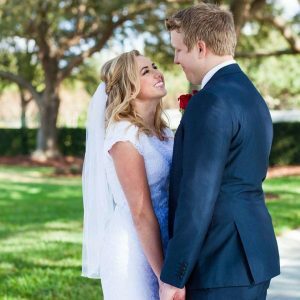 A Bridal Center is committed to designing and manufacturing bridal gowns that reflect superb quality, original design, and attention to detail. Each gown is unique from the hand beaded designs & exquisite laces, to the fit and customization for every bride’s specific needs. A Bridal Center each gown is handmade and fitted to perfection so you can dazzle the crowd at any event. You'll find dresses in various colors, styles, lengths, and materials that celebrate your uniqueness. We guarantee that you'll feel exquisite with the first luxurious touch of one of our gowns.